ON FEBRUARY 22ND, more than two months since the start of the current uprising against President Omar al-Bashir and his regime, millions of his Sudanese compatriots gathered with bated breath in front of their television screens. Earlier in the day Sudan’s security chief had briefed journalists that Mr Bashir would step down as head of the ruling party he has led for almost three decades. Amid mounting excitement rumours swept the country that he would announce his intention to resign as president next year rather than stand for another five-year term. Would he bow out even sooner? No such luck. Mr Bashir began by sounding conciliatory. “The demands of our people for better living conditions are lawful,” he said, calling for a national dialogue. He told parliament to postpone the constitutional amendments that would have let him seek another term. But then, suddenly, his tone changed sharply as he declared a one-year state of emergency. His government, he said, had been dissolved. There was no sign that he would step down. This allows Mr Bashir to suspend the constitution. Security forces may raid premises without warrants and seize property. Decrees issued three days later ban unlicensed gatherings and protests, as well as the trading or hoarding of fuel and other subsidised goods. So in practice little has changed, since several of Sudan’s 18 states were already under emergency law and the security forces have long enjoyed immunity from prosecution. They have killed at least 50 people since the start of the crisis. Mr Bashir is still far from secure. Diplomats and politicians in Khartoum, the capital, think he may yet be ousted. His latest move may have been prompted more by discord in ruling circles than by protests on the streets. But the balance of power may have altered. Since grabbing the reins in a coup in 1989 he has governed in alliance with Islamists, many of whom now reject him. By dissolving the government he has boosted the army, perhaps pre-empting a military attempt to overthrow him. His new cabinet is dominated by technocrats and generals. All 18 state governors have been replaced by military men. “He’s sending a message to the Islamists that he is no longer their champion,” says Ahmed Soliman of Chatham House, a think-tank in London. He may, as a result, be edging away from the Islamists of Qatar and Turkey, with their ties to the Muslim Brotherhood, and instead lean back towards the rival regional club led by Egypt, Saudi Arabia and the United Arab Emirates, which all loathe the Brotherhood. To appeal to young Sudanese, especially women, Mr Bashir has offered to review draconian laws prohibiting “immoral” clothing, among other offences. 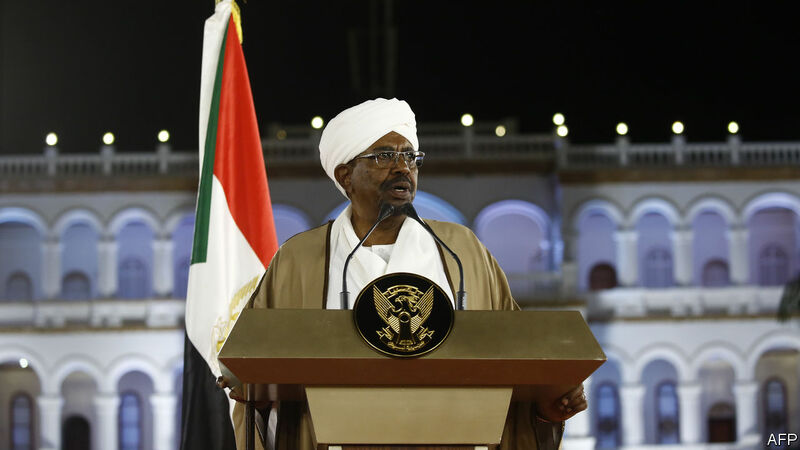 By sidelining the Islamists Mr Bashir may hope to be rewarded with cash to stave off Sudan’s interminable economic crisis. But violence may well increase. The opposition has furiously rejected the president’s call for dialogue. Demonstrations following the declaration of emergency were the angriest in weeks. On February 24th a medical school in Khartoum was ransacked by security forces. Female students were reportedly whipped.